ORROUS & CO Women's 18k Cubic Zirconia Earrings - Beautiful White Gold Plated Studs - 1.90 Carats Round Cut Cubic Zirconia - Cushion Shaped Gemstone Halo - Beautiful & Elegant Gift Idea | What Should I Say? a lady's touch of luxury & class - forget all about cheaply made, gaudy trinkets and faux bijoux. the sign of a real lady is the elegance and class of her style. and nothing says "class" than a stunning round-cut cubic zirconia, bound in white gold and framed in a brilliant halo of smaller stones! timeless beauty & design - fashion and trends come and go - but true elegance stays unchanged and always relevant. these beautiful earring designs have stood the test of time, and are a true timeless classic that you'll be able to enjoy wearing for years and years to come! finally, the elegance & excellence you deserve - when it comes to fine jewelry, there's no room for cutting corners. these premium orrous & co stud earrings are made with nothing but the finest 18k white gold, which will never become oxidized, shadowed, or dirty. what's more, they're created with masterful craftsmanship and strict quality control. you deserve nothing less! a beautiful gift for the women in your life - if you're looking for a thoughtful and lovely gift for one of the precious ladies in your life, then you've just found it! 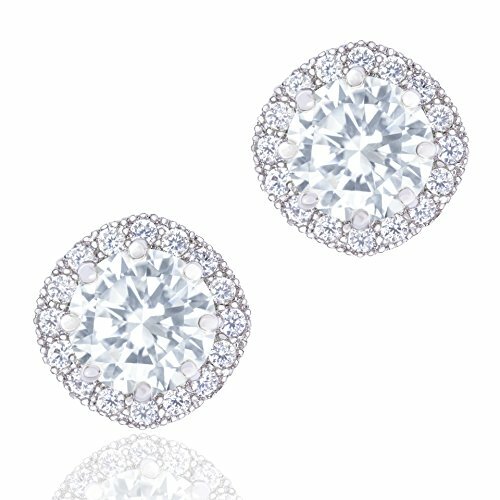 these wonderful 18k cubic zirconia white gold stud earrings are an amazing present idea any woman would love to receive! your satisfaction is 100% guaranteed! - at orrous & co, we take pride in providing our customers with fine jewelry of unparalleled quality and excellence. all of our pieces come with a full 3-year warranty covering manufacturing and material defects, as well as our guarantee for exceptional customer service and satisfaction! If you have any questions about this product by ORROUS & CO, contact us by completing and submitting the form below. If you are looking for a specif part number, please include it with your message.